beneath the surface: who was gladys hunkin? last weekend we went to trelisick and i discovered an amazing little second hand bookshop tucked away behind the courtyard. there was talk of an accident. a horse had been hit by a car just along the road. nobody knew exactly what had happened but i was filled with a sense of dread at hearing this. i longed to browse through all the books but not wanting to spend too much time or money i homed in on one i liked the look of. it was a small matt grey hardback with a black ink line drawing of a bird, flowers, moth, shell and a fish radiating out from a central anemone-like flower. 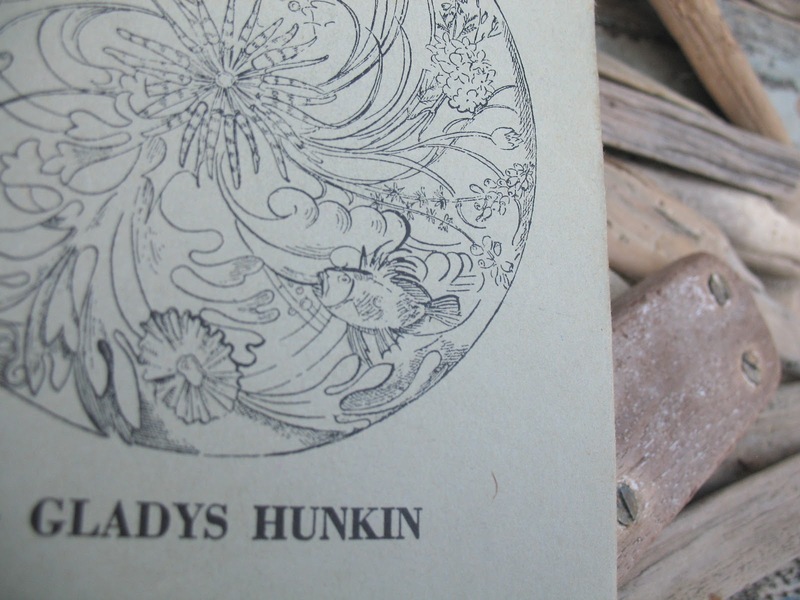 it was a book of poems called 'cornish crystal' by 'gladys hunkin'. i'm not one to adhere to 'never judging a book by it's cover'. when i'm in second hand shops i'm always drawn to particular books primarily by how they look and feel followed by the sound of the title and the name of the author. only then do i open them to see what might lie inside. in this case, i liked the look and feel of the book, the title and the name of the author. inside was a dedication to a. l. rowse and i loved the roughly torn edge of the thick pages. some were loose and i was careful not to let any poems flutter away. there was also the odd correction - a letter crossed out and replaced by another in faded blue fountain pen ink. skimming down the list of contents i immediately warmed to many of the titles - the sea, the windswept thorn, solace, on declining the gift of a caged bird (this one in particular), cornish chough, sea sorrow, tears into pearls, coracle of spring, secret stream, the stuffed kingfisher, song of the sea at najizel, nostalgia, unanswered, the dead fliers, storm spar, burning the lifeboat, dark flower, birch in winter, the wishing moon, hoverfly, miss marshall muses, fire enchantment, flower of peace, moth light, rainbow chromatic, white verge of sleep, shards of memory....... to name a few. buying the book proved a little tricky. first i was asked by an older lady if i was 'in a panic'. i took this to mean 'in a hurry' so i said no, i wasn't. but it was on my mind that my hot chocolate might be arriving at the table in the courtyard at any minute (and i suppose it was possible that the thought of it going cold could induce a very mild panic..... but it was unlikely). she informed me that she was showing another older lady how to use the card machine so i said that was fine. the lady in training fell into a deep state of concentration and the shop echoed with concerned voices, people sharing their stories of seeing the horse lying under a blanket. i caught little snippets here and there and tried to work out if that meant it was dead. but there was trouble with the card machine and they were going to have to phone the helpline. they apologised and said 'i bet you wish you'd never tried to buy this book don't you!' i really didn't. i went and rescued my hot chocolate. eventually they told me i'd have to go and pay for it in the shop. this took a while as the system only worked by scanning and there was nothing to scan on the book, just a figure saying 7s. 6d. in the end i could have made up any price or just walked away with it - all a little test of my honesty. later that evening i started reading 'cornish crystal'. there are some very moving and beautiful poems. some short and to the point and others rich with visual imagery but minimal description. they are very personal poems that come from the heart. and throughout the book runs a strong individual authentic voice with a refreshing lack of religious morality, stuffiness and controlled form which i often find in writing of this period. in spindrift, tossed from crests of mounting waves. "kee-ow, t'chuff, t'chuff" the waters echo back. in history that time will not outreach. with purple and blue inlay. with joy in its brief fate. and i love the way gladys doesn't hold back! upon reading this one i was filled with total respect for the poet...... bowed to her sheer poetic brilliance as demonstrated in the 16th line...... and wanted to know more about her. and shot her dead at sight,"
he said. "a shame," i muttered. i longed to smash his smug white face! crushed upon the sighing sedge. but i haven't been able to find out anything about her and i'm very intrigued. she writes for fellow cornish poet and historian, a. l. rowse and is heart broken at the death of a lover (could it be rowse?) and is trying to come to terms with her deep grief through many of these poems. but who was her lover and did he die in the war? it's hard to tell. some of the poems are written in the 30s and 40s and the book, by fortune press, apparently was published in 1952. Gladys Hunkin.—Dated the 6th day of January 1939." and someone has done some research on the hunkin surname (nearly all from mevagissey) and on his website there is an entry for a william verinder hunkin, son of henry hunkin and susan ley, born on the 24th april 1854 in mevagissey. occupation- fisherman. married sarah ann clark in 1880 in st austell. died 3rd july 1915 in mevagissey and is buried in mevagissey. he had 5 children- ada, gladys, percy verinder, claude and cecil. so i'm guessing this must be gladys, but i'd love to know more about her.